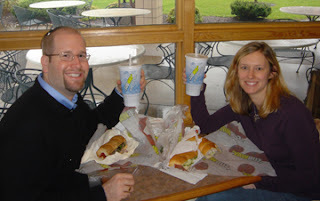 My wife and I ate at the Kosher Subway restaurant located at the Cleveland Ohio JCC a few months ago when we were in town for the Friends of the Israel Defense Forces and Cleveland Cavaliers/Maccabi Tel Aviv basketball game. In addition to getting the chance to see our friend Rabbi Steve Weiss of B'nai Jeshurun, we really enjoyed being able to order a meatball and [parve] "cheese" sub and a sub loaded with delicious deli meats. I thought it was much better than the Subway experience I remember from Jerusalem in 1996 when there was still a Subway restaurant on Jaffa Street downtown. Well, it looks like a new Subway restaurant is set to open this April in Los Angeles. 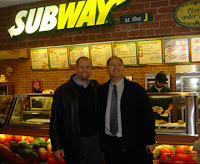 Hopefully there will be more Kosher Subway restaurants opening soon in Jewish communities like Chicago, Atlanta or Detroit. I see you have added us to this page...thank you very much!